Self-Employed? The Marketplace and Medicaid are Open for You! — Healthcare Counts! Self-Employed? The Marketplace and Medicaid are Open for You! Let's say that you have a small carpentry business, or you run a day care. Most of the time it's just you, occasionally you pay a helper. Your business is really too small to get a health insurance plan through the business. Depending on your income, it is very likely that you can choose an affordable plan on the Marketplace. If your income is on the low side, you may even qualify for Medicaid. Medicaid income guideline information. When we talk about INCOME for people who are SELF-EMPLOYED, we are really talking about NET PROFIT. So--let's say that you get paid $10,000/month for a contract, but your expenses are $5,000/month. Your NET PROFIT is $5,000/month. If that is steady year-round, then you would have an annual income of $60,000. But for many people who are self-employed, contracts have their highs and lows. It could be that you make a net profit of $5,000/month five months out of the year. The rest of the time, you barely break even. That would give you an annual income of $25,000. For most self-employed people, your adjusted gross income (found on line 37 of the front page of your 1040 taxes) can be used to qualify for either the Marketplace or Medicaid. You can use last year's information to prove your income, unless you have some reason to think that your income this year will be significantly different from last year. Last, but not least--if one person in a household has an offer of employer insurance, that can also affect eligibility. Read more about employer offered insurance. 1. They didn't know they could qualify. 2. They haven't done last year's taxes. Doing last year's taxes isn't a requirement for getting health coverage, but it does make things a lot easier. However--if you do get a Marketplace plan, you will need to do your taxes for the following year to reconcile your Advanced Premium Tax Credits. If you think you will qualify for the Marketplace (healthcare.gov), you must sign up during Open Enrollment, November 1, 2015 to January 31, 2016. 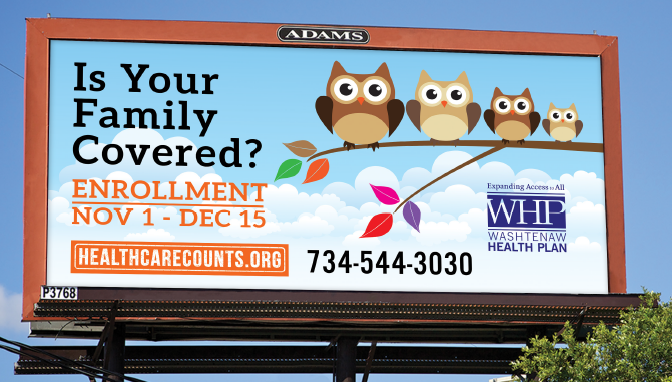 Medicaid enrollment is always open, you can apply anytime at https://www.mibridges.michigan.gov/. If you are not sure, please call a nonprofit agency to help you. Find one close to you and make an appointment. NOTE: Is your business a bit bigger? Check out the SHOP Marketplace to see if you can offer insurance to everyone who works for you!